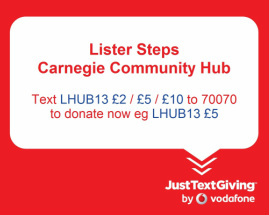 Lister Steps is a community based charity caring for children from 6 weeks to 14 years of age through nursery, playgroup, breakfast and after school clubs and school holiday schemes. For more information about our childcare services, please visit the Lister Steps website. We welcome all donations which we will use to fit out and purchase furniture, resources and equipment for use in The Old Library. Please let us know when you donate so we can thank you! Unless otherwise stated, the material published within this website is the property of Lister Steps. No part may be reproduced without the specific written permission from Lister Steps.